Classic blazer with pockets and Dior-shoulders, which is a slight width on the shoulders, that gives a beautiful silhouette. 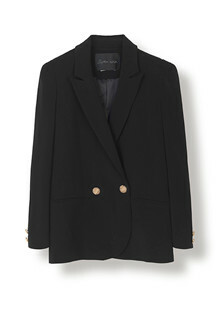 The blazer has large goldbuttons on the front as closure and on the cuffs. Style with our Sigrid pants for a masculine, but modern look or over a dress for an edgy look that mixes the masculine and the feminine.